L Camp Road at large reservation sign. DeMuro Field, R Shirley Terrace, R Alberta. 1st R Round Hill, R Alize. Famularo's Deli OR R Saw Mill, L Allen. L Siek then R, L Alpine. Anderson Lane (#1)	L Kinnelon, L Ricker, 2 R Anderson. Banta Court (#1)	L Kinnelon, 4 R Kakeout, R Banta, R Banta Court. Banta Road (#1) 	L Kinnelon, 4 R Kakeout, R Banta Road. 2 L Beechwood, R Beechwood Terrace. R though gate, L Normandy, L Belvidere Drive. Birch Road (#1)         L Kinnelon, 4 R Kakeout, 4 R Birch. Boonton Reservoir (#2)	L Fayson Lakes, R Boonton. Braebank (#2)	        L Kinnelon, R Rt 23, R Cutlass, L Braebank. R though gate, R Normandy curves L to Breckenridge Terr. Brentwood Drive (#2)	L Fayson Lakes, 4 R Lakeview, L Brentwood. Brisee Road (#1)	L Kinnelon, 2 L Maple Lake, L Brisee. Brookvale Road (#3)	L Sleepy Hollow, L Gravel Hill, R Brookvale. Brook Valley Road (#2)	L Fayson Lakes, R Boonton, L Brook Valley. Brush Hill Terrace (#3)	R Crossway, L Brush Hill Road, L immediately. after Stonybrook School L Colonial, R Cabot. R Siek, top of hill Carl. Cascade Way (#1)	L Kinnelon, 4 R Kakeout, L Cascade. Chapel Hill Terr. (#3)	L Perimeter, L Sleepy Hollow, L Chapel Hill. to Smoke Rise Rd, L Cherry Tree Lane. L Brook Valley, 2 L Chilhowie. R Powder Horn, R Christine. Clearwater Road	(#1)    R Kinnelon, R South Glenn, 2 L Clearwater. S.P. is all the way to the end. Cliff Trail (#2)	L Fayson Lakes, 3 R past store Cliff. Clubhouse Trail (#2)	L Fayson Lakes, past store L Clubhouse. R White Birch, R Cook. Corral Suction P't (#3)	Perimeter Road next to corral at Talbot Drive. boat docks and one residence. Crossway Suct. P't (#3) R Crossway to end at lake. Draft from lake. Cutlass Road (#1)	L Kinnelon, R Rt 23, R Boonton, 2 L Cutlass. Dam Road (#2)	        L Fayson Lakes, after Clubhouse L Dam Road. Dam Road S.P. (#2)	L Fayson Lakes, after Clubhouse L Dam Road. Dean Avenue (#2)	L Kinnelon, R Rt 23, R Boonton, L Dean. Decker Terrace (#1)	L Fayson Lakes, R Decker. 4th R Ski Trail, 1st R Deer Trail (dirt trail). R Sawmill, L Geoffrey to Denise. Derrygally Circle (#1)	R Kinnelon, 3 L Strong to Derrygally Circle. R Round Hill, 2 R Dixon. Dogwood Trail (#2)	L Fayson Lakes, L Toboggan. Duchess Drive (#2)	L Fayson Lakes, L Clubhouse, 2 L Duchess. East Gate Road (#3)	Out East Gate and back in. East Lake Road (#3)	R Crossway, R or L East Lake Road. East Shore Drive (#3)	R Crossway, L/R at lake. Edgemere Terrace (#2)	L Fayson Lakes, L Boonton, L Edgemere. OR L Fayson Lakes L Elm. Eric Drive (#1)		L Kinnelon, R Kiel, 2 R Forestdale, R Eric. Erma Court (#2)		L Fayson Lakes, R Decker, 2 R Erma. Evergreen Terrace (#2)	L Fayson Lakes, L Evergreen 2 L before Boonton. Fawn Hill Run (#1)	R Kinnelon, L Pheasant Run, L Fawn Hill. Fay Drive (#2)		L Kinnelon, 4 R Kakeout, R Tintle, R at top Fay. Fayson Lakes Rd (#2)	R Kinnelon, L Fayson Lakes. Felkay Drive (Pvt)(#1)	R Kinnelon, R South Glen, 1 L after Mica Drive. Fiddler's Elbow Tr. (#2)	L Fayson Lakes, L Clubhouse, L Fiddler's Elbow. Fieldstone Drive (#2)	L Fayson Lakes, L Boonton, L Shirley, R Fieldstone. Foothill Drive (#1)	R Kinnelon, L Ricker, R Foothill. Forestdale Road (#1)	L Kinnelon, R Kiel, 2 R Forestdale. Forge Pond S. P.(#1)	East Gate, immediate R Kinnelon. Standpipe on right. Fox Terrace (#3)	R Crossway, 2 R Fox Ledge Road, L Fox Terrace. Franklin Lane (#2)      L Fayson Lakes, L Boonton, R Saw Mill, 3 R Franklin. Galloway Terrace (#2)	L Fayson Lakes, L Boonton, R Highlands,  L Galloway. Geoffrey Drive (#2)	L Fayson Lakes, L Boonton, R Sawmill, 2 L Geoffrey. Glendale Terrace (#2)	L Fayson Lakes, last R before Boonton. Glenrock Drive (#2)	L Fayson Lakes, R Lakeview, L Brentwood, L Glenrock. Goldfinch Run (#1)	R Kinnelon, L Pheasant Run, 4 L Goldfinch. Gormley Lane (#2)	L Kinnelon, 4 R Kakeout, 7 R Gormley. R Linden, dirt road end Old Gormley. 2 R though gate, 1 R Garden Place. Gravel Hill Road (#3)	L Perimeter, L Sleepy Hollow, L Gravel Hill. 3 L Gravel Hill Terrace. Green Hill Road (#3)	R Crossway, R East Lake to Green Hill #1-31. R on Green Hill to #32-85.
past Hazlewood, R on cul-de-sac at #61. 2 R Green Hill Terrace. R Cabot, R Midland, R Sylvan, L Greenwood. Harrison Road (#1)	L Kinnelon, R Ricker, to Kiel, R Lincoln. cross I287, L Jardine, 2 L Harvest. 9,000 gal tank in ground on right. Hearthstone Drive (#1)	L Kinnelon, L Ricker, R Foothill, R Hearthstone. L Hemlock Lane,	R Hemlock Terrace. just past #8 and behind #4 about 100 feet in. 2 R Kayhart to Hidden Acres. Highlands Drive (#2)	L Fayson Lakes, L Boonton, R Highlands. Hillside Road (#1)	L Kinnelon, L Ricker, R Foothill, L Hillside. L Mountain R Ridge, L Hilltop. Holly Trail (#2)	L Fayson Lakes, L Dam Rd, R Lakeside, R then L.
Snow or ice: enter Twin Lakes, straight Holly. Hoot Owl Pond S.P. (#3) R Crossway, R Brush Hill. Standpipe on right after Hoot Owl Terrace. Hoot Owl Terrace (#3)	R Crossway, R Brush Hill, R Hoot Owl Terrace. Hornbeam Lane (#3)	R Crossway, R Brush Hill, L Hornbeam. Huckleberry Court (#1)	R Kinnelon, R South Glen, 6 L Huckleberry Court. cross I287, L Jardine, L or R Jacksonville Rd. cross I287, L Jardine Land. (also Turtle Pond)	R Kinnelon, L just before Lake Juliet. (NOW is Ballen Way)	Behind Smoke Rise stables off Talbot Drive. Joanna Way S.P. (#3)	R Crossway, R East Lake, L West Shore. S.P. is standpipe on WestShore 75 ft past Joanna. Juliet Drive (#1)	R Kinnelon, L Juliet opposite Rickabear. Juniper Terrace (#2)	L Fayson Lakes, L Dam Rd, R then L Juniper. Kakeout Road (#1)	L Kinnelon, R Kakeout past Kinnelon Mall. Kayhart Road (#2)	L Fayson Lakes, L Boonton, 2 R Kayhart. to end), 3 R Kent Brook. Kiel Avenue (#1)	For numbers above #103 (Co. 1) L Kinnelon, R Kiel. For numbers below #103 L Kinnelon, 2 R Ricker to Kiel. For #174 and lower turn LEFT. Kitchell Drive (#1)	L Kinnelon, R Maple Lake, L Kiel, to Kitchell. go to end, R then L to Lagoon. Lake Juliet (#1)	R Kinnelon, opposite Rickabear. Lakeview Drive (#2)	L Fayson Lakes, R Lakeview. Laurel Lane (#3)	L Sleepy Hollow, L Gravel Hill, R Green Hill, R Laurel. L Arrowhead, 2 R Laurel Trail. after BJ's Warehouse, immediate L = Lead Mine Road. Leone Terrace (#1)	L Kinnelon, 4 R Kakeout, R Banta, L Leone Terrace. R White Birch bear L Lilac. Lincoln Road (#1)	L Kinnelon, R Ricker, to Kiel, R Lincoln. Lincoln Road (Butler)	N. Gate, Rt 23 So, R after Butler Ridge Apts. Linden Lane (#2)	L Kinnelon, 4 R Kakeout, R Gormley to Linden. Linnview Estates (#2)	L Fayson Lakes, R after Miller Road. Long Meadow Road (#3)	R Perimeter, L past Inn, 2 L Long Meadow. Louis Lane (#1)		L Kinnelon, R Kiel to Co. #1, R Louis. R White Birch, L Lyons. Magdalena Court (#1)	R Kinnelon, R South Glen, 2 L Clearwater, R Magdalena. R though gate, L Normandy, 1 R Manchester. cross I287, L Jardine, L Jacksonville, 2L Manrodt. Maple Lake Road (#1)	L Kinnelon, L or R at 2nd light is Maple Lake. 2 R Holly, L Maple. Marion Avenue (#1)	L Kinnelon, 4 R Kakeout, L Cascade, R Marion. Matilda (#1)		L Fayson Lakes, L Brook Valley, L Matilda. Rt 23 North to L Matthews. L at Y then R McKinley. Meadow Lane (#1)	L Kinnelon, L Ricker, 2 L Meadow. Mica Drive (#1)		R Kinnelon, R South Glen, 3 L Mica Drive. Miller Road (#1)	R Kinnelon, L Fayson Lakes, 3 R Miller. R Highlands, R Misty Ridge. R though gate, L Normandy, 2 R or L is Monarch. L Geoffrey Drive, R Denise Drive, R Moon Shadow. Mountain Road (#3)	R Crossway, R East Lake to Green Hill, 2 L Mountain. R Cabot, R Midland, 2 R Mulberry. R though gate, 1 L or R is Normandy. Old Cow Pasture Lane(#3)R Crossway, R Old Cow Pasture. Old Woods Road (#1)	R Kinnelon, L Old Woods past Fayson Lakes. Orchard Road (#3)	L Perimeter, R Robins to Orchard. OR L Fayson Lakes, L Dogwood, L Partridge. cross I287, L Jardine, L Peachtree. 2 R Pepperidge Tree Lane. 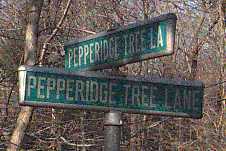 R Pepperidge Tree Lane, to Pepperidge Tree Terrace. Perimeter Road (#3)	= Co. 3 home base and L at Inn. Pheasant Run (#1)	R Kinnelon Road, 3 L Pheasant. Pine Hill Drive (#1)	L Kinnelon, R Kiel, L Kakeout, 5 R Pine Hill. Poinsettia Court (#1)	L Fayson Lakes, 2 R Honeysuckle, R Poinsettia. Post Court (#1)		L Kinnelon, 4 R Kakeout, 6 R Post. Quail Court  (#1)	R Kinnelon, R South Glen, R Quail. Reality Drive (#2)	L Fayson Lakes, R Lakeview, 2 L Reality. Red Oak Lane (#3)	R Crossway, R East Lake, L West Shore, R Red Oak. Ricker Road (#1)	L Kinnelon, L or R at 1st light is Ricker. Ricker Terrace (#1)	L Kinnelon, L Ricker Road, L Ricker Terrace. L Mountain, R Ridge, to Ridge Road Terrace. L Wagda, R Ridge St.
Ridge Trail (#2)	L Fayson Lakes, 2 R past store, Ridge Trail. Robins Lane (#3)	R Perimeter, R Robins past Long Meadow. Rock Ledge Road (#3)	L Perimeter, L Sleepy Hollow, R Smoke Rise, 2 L Rock Ledge. Rock Wall Terrace (#1)	L Kinnelon, R Kiel, L Rock Wall past Co. 1. R Midland, L Hillside, L Rockwood. R Round Hill, L Round Hill Road. Sabies Beach Road (#2)	L Fayson Lakes, L Dam Rd, L Sabies beach. Sabies Beach S.P. (#2)	L Fayson Lakes, L Dam Rd, L Sabies beach. Draft from lake at beach or past beach. Sanders Road (#2)	L Fayson Lakes, L Boonton, L Sanders after Colonial. Saw Mill Road (#2)	L Fayson Lakes, L Boonton, 2 R Saw Mill. R Powder Horn, L Tammy, L Scott. Seabert Lane (#1)	L Kinnelon, 4 R Kakeout, 4 R Birch, R Seabert. R Ridge, L Hilltop, L Shadyside. Sheep Rock Road (#1)	L Kinnelon, 1 L Ricker to end, R Sheep Rock. Shirley Terrace (#2)	L Fayson Lakes, L Boonton, L Shirley. Shore Drive Terrace(#3)	R Crossway, R East Lake, R Shore Drive. Siek Road (#2)		L Kinnelon, R Rt 23, R Boonton, L Dean, L Siek. R Ski Trail after Echo Valley. South Gate Road (#3)	R Perimeter, R Robin to Orchard to end. Dirt road at cul-de-sac is South Gate Road. South Glen Road (#1)	R Kinnelon, R South Glen. South Glen Road S.P. (#1)R Kinnelon, R South Glen to near end. S.P. is standpipe on R before the end. South Point Terrace(#2)	L Fayson Lakes, last L before Boonton. Spice Bush (#3)		Exit E. Gate, U-TURN & REENTER, R Spice Bush. 9,000 gal. tank in ground on right at end. L Mountain, R Ridge, L Hilltop, 4 L Springwood. R Lakeside, 2 R Standish. Stevens Avenue (#1)	L Kinnelon, 2 L Maple Lake, L Brissee, R Stevens. Stillwater Drive (#1)	L Kinnelon, 4 R Kakeout, L Cascade, R Stillwater. Stillwater Pond (#3)	Jeep trail on SW side of Smoke Rise Lake. R though gate is Stockton Dr.
Stone House Road (#3)	East Gate Road exit to Stonehouse. Stonybrook Highlands(#2)L Fayson Lakes, L Boonton, R Highlands Dr.
Stonybrook School (#2)	L Fayson Lakes, L Boonton, opposite Saw Mill Road. R Water's Edge to Stonybrook Trail. Strong Drive (#1)	R Kinnelon, L Strong Drive. 2 L Brush Hill, R Summit Terrace North. 2 L Brush Hill, L Summit Terrace South. Sunrise Terrace (#2) 	L Fayson Lakes, L Boonton, 6 R Sunrise. Sycamore Trail (#2)	L Fayson Lakes, L Toboggan, R Sycamore. R Cabot, R Midland, next L or R is Sylvan. Talbot Drive (#3)	L Perimeter, R Talbot. (on Ballen Way)		L Perimeter, R Talbot Drive, L Ballen Way. S.P. is on right by lake. stables to L on Ballen Way. R Red Oak, 2 L Tamarack. R Powder Horn, L Tammy. Tanager Run (#1)	R Kinnelon Rd, L Pheasant Run, 3 L Tanager. Thomas Road (#1)	R Kinnelon, R. South Glen, 6 L Julia, L Thomas. L Old Hamburg Tpk, R Timberbrook Road. Tintle Road (#1)	L Kinnelon, 4 R Kakeout, 7 R Tintle. Toboggan Trail (#2)	L Fayson Lakes, L Toboggan. L Mountain Road, R Ridge, L Hilltop, 2 L Tower Hill. 2 L Tower Hill to end. S.P. on right. L Lakeside, 2 R Holly, R at Maple  to Trail West. Trommel (#1)		L Kinnelon, 2 L Maple Lake, 2 L Trommel. (also Jay Pond)(#1)	R Kinnelon, L just before Lake Juliet. Twin Lakes S.P. (#2)	L Fayson Lakes, L Boonton, 2 L Twin Lakes. just past int. of Twin Lakes and Lakeside. R Ridge, L Hilltop, R Undercliff. cross I287, L Jardine, L Jacksonville, L Voorhis. Wagda Avenue (#1)	L Kinnelon, 4 R Kakeout, L Cascade, L Wagda. Walnut Lane (#1)	L Kinnelon, 4 R Kakeout, 7 R Gormley, L Walnut. Water's Edge (#2)	L Fayson Lakes, L Toboggan to Water's Edge. Westcrest Trail (#2)	L Fayson Lakes, L Toboggon, 3 R Westcrest. West Shore Drive (#3)	R Crossway, R East Lake, L West Shore. West Shore Dr. S.P. (#3)	R Crossway, R East Lake, L West Shore to end. R White Birch bear L Cul-de-sac at 2nd Lilac Ct.
Whitty Road (#1)	L Kinnelon, R Kiel, R Whitty. Willis Decker's Pond(#1)Corner of Fayson Lakes and Kinnelon. R though gate straight is Wilshire Terr. Woodland Court (#1)	L Kinnelon, R Rt 23, R Cutlass, R Woodland.